Click here to find ignition coils for your vehicle. Although modern automotive ignition systems have reached a high level of sophistication, they are not that much different than they were fifty years ago at their core, given the fact that ignition coils have not changed in meaningful ways since they were invented more than 100 years ago. This guide will discuss ignition coils in terms of what they do, what happens when they fail, and how to replace faulty ignition coils. The function of ignition coils is to generate the sparks that ignite the air/fuel mixture in spark ignition engines by means of converting a low-energy current into a high-energy current that typically exceeds several tens of thousands of volts. On older cars, the ignition coil was a single component that fed output current into a mechanical distributor which distributed the current to each individual spark plug. Modern cars typically have individual coil packs for each cylinder, which allows for more precise control of the ignition system via the ECU resulting in more power and better efficiency. The construction of an ignition coil is relatively simple, however the associated physics are a little more complex. Ignition coils typically have two sets of copper wire windings. The first set, known as the primary windings, receive current from the battery which stores energy and creates a magnetic field within the coil. The second set, known as the secondary windings, generate the ignition spark when the magnetic field in the primary winding collapses when power is removed from the coil. Without belaboring the science further, the ignition coil converts low voltage current from your battery into high voltage current capable of igniting the air fuel mixture. As with all ignition components, ignition coils play a critical role in efficient engine operation, and defects, failures, or malfunctions in one or more ignition coils usually have serious negative effects on fuel economy, power delivery, emissions, and general drivability of an affected vehicle. Depending on the nature of the failure, misfires may be present on one or more of your engine’s cylinders. Note that misfires may be permanent, intermittent, or may appear only under certain driving conditions, such as hard acceleration when the demand on ignition coils is greatest. Note that misfires may also result from using substandard aftermarket ignition coils on applications that require the use of OEM equipment. Ignition coils that are not functioning optimally produce low energy ignition sparks that are incapable of igniting the air/fuel mixture efficiently. Note that poor fuel economy may also result from using substandard aftermarket ignition coils on applications that require the use of OEM equipment, since substandard coils often cannot cope with the demands of high compression, high engine speeds, or multi-spark systems. Since ignition coils that are not working properly have a direct negative bearing on combustion, the poor combustion may produce varying degrees of power loss, depending on the vehicle make, vehicle model, and severity of the problem. It should be noted that many other components such as the fuel injectors or fuel pumps can also cause similar power loss so it’s important to verify root cause before replacing parts. For the rare case when multiple ignition coils on an engine fail at the same time, the effect on combustion can result in hard-starting or no-start conditions. For both older cars with a single ignition coil and modern cars with an individual coil pack for each cylinder, replacing ignition coils should be well within the capabilities of even novice mechanics. We typically recommend replacing one at a time. We should also note that replacing your coil or coil packs is a great time to think about replacing your spark plugs as well if they are overdue. Step 1 – Make sure the ignition is switched “OFF” as risk of shock exists, and that the engine is cold to prevent burns and scalds. Remove all protective/cosmetic covers and shields (where applicable) from the engine, and place them aside. Usually these covers are held on by small clips or fasteners and can usually be removed without any tools. Step 2 – If the coils are easily accessible, disconnect the low current electrical connector, but take great care not to break any retaining or locking devices on the connector. You should be able to pull most connectors off by hand by gripping firmly at the base, however certain connector styles may require use of a small screwdriver. Step 3 – Using a suitable socket and ratchet or a small combination wrench, remove the retaining bolts that secure the coil, and place them aside. Simply pull the coil out of the cylinder head, and install the replacement. Sometimes this can take a little bit of finesse, so be patient. Reassemble all parts in the exact reverse order of removal, but be sure not to over tighten retaining bolts to prevent damaging the soft threads in the engine. You can ensure that you tighten the bolts to proper torque listed in your repair manual by using a torque wrench with an appropriate range. If you are replacing a coil pack with multiple leads, make sure that you replace each cylinder’s lead in the same position on the replacement coil pack. Crossing plug leads affects the engine’s firing order, and it may either misfire severely, or not start as a result. Step 4 – Start the engine to verify the repair. If something doesn’t seem right, turn your engine off immediately, troubleshoot, and address any issues. Spectra ignition coils are known to meet, and often exceed OEM manufacturing and performance standards as the result of innovative manufacturing processes and stringent quality control checks. Moreover, Spectra’s ignition coils are subjected to long-term thermal shock tests at temperatures from as low as -50 degrees F, to as high as 300 degrees F to ensure that every coil that leaves the factory is able to withstand extreme operating conditions. To back up the claim that Spectra ignition coils are always up to any challenge, Spectra offers a limited lifetime warranty on their products. Overall, we have had good luck with them over the years and can give them a strong recommendation. 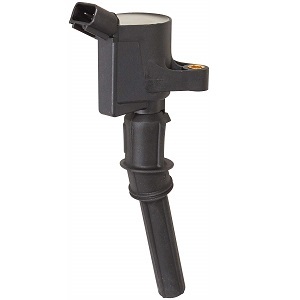 Click here to find Spectra ignition coils for your vehicle. Unlike most other ignition coil manufacturers, Delphi uses advanced technologies to control the length of pure copper wire in each winding. This ensures that each Delphi ignition coil always delivers ignition sparks of the same intensity and duration, which is critically important on high-end, high performance applications. Nonetheless, Delphi delivers many millions of ignition coils each year to car makers such as Ford, Toyota, Nissan, Lexus, GM, Mazda, Subaru, Acura, and many more in the North American market, which means that Delphi can likely supply ignition coils that were purpose-made for your particular vehicle. We are confident that you will be happy if you choose to install Delphi ignition coils in your vehicle. Click here to find Delphi ignition coils for your vehicle. MSD is widely regarded as a leader in the performance industry, and as such, the company designs, develops, and produces ignition coils that are matched to the other components such as ignition modules, crank triggers, spark plug leads, and spark plugs they also produce. They are one of the long-time favorites of the hot rod and muscle car community, and are widely used across many enthusiast groups. MSD performance ignition coils are as happy giving you a competitive edge on the track or drag strip as they are when being used in continuous duty applications, such as in your daily driver. Overall, we are happy to give MSD a strong recommendation. Click here to find MSD ignition coils for your vehicle.